'The program downloads for OS X as a disk image which Apple's Safari browser will open automatically. Click this link to begin downloading. When the download is complete Safari opens a finder window on the virtual disk which contains the application. 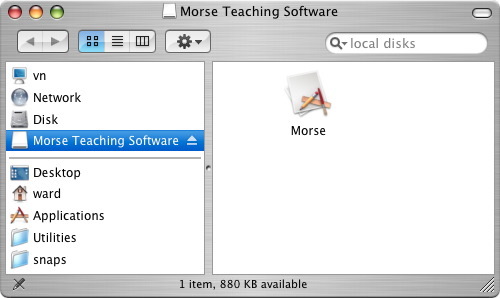 Double-click the Morse application icon to launch the program. The application is a single file. Drag the application to your desktop or, if you prefer, your applications folder. When you've done so you can eject the virtual disk and discard the Morse.dmg disk image. Thanks go to Justin Burket for building OS X 3 & 4 image. Thanks go to Travis Brown for building the OS X 6, 7 & 8 image. We've tested the 6, 7 & 8 image on OS X 9 and found it to work. We did have to visit the System Preference, Security & Privacy settings to specifically allow this software to run.